This Wednesday, January 27, at 8:00 pm, Penn will welcome the first of three remarkable pianists for the series of concerts devoted to new music, Eighty-Eight Lately. Marilyn Nonken was an outstanding artist on the scene in the later part of my time as a student in New York in the ’80s, and she has continued to be a tremendous advocate for living composers. She is particularly associated with spectralist composers like Murail and Dufourt, in part because of her elegant book, The Spectral Piano. Pieces by those two composers will be on the January 27 concert, along with music by David Rakowski, Mikel Kuehn, Richard Carrick (the works by the latter two composers are premieres), and Christopher Trapani. Later installments of the Eighty-Eight Lately series will feature Gregory DeTurck and Matthew Bengston. All the concerts are at Rose Recital Hall in Fisher-Bennett Hall on the Penn campus at 34th and Walnut. – If you are in Philadelphia, you should consider taking your Saturday night date to the second in The Crossing’s Month of Moderns programs. Works by Kile Smith, Kamran Ince (a premiere) and Gabriel Jackson. Program notes here. -And in New York the concert of choice is the program put on by the Washington Square Contemporary Music Society in collaboration with ICSM/League of Composers, featuring five U.S. or world premieres: Shulamit Ran, David Rakowski, Missy Mazzoli, Elliott Carter and Arthur Krieger. Program notes here. 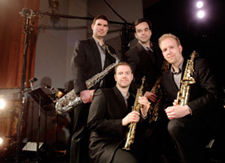 The sax quartet Prism has announced its performance schedule for the current season. I’m happy to say this includes a performance of my Straight Up, which I wrote for the group’s 20th anniversary a few years ago. My piece was one of a group of twenty-three short pieces written for the occasion, and all of them have been recorded for Innova. CD release concerts will take place at WXPN’s World Cafe here in Philly, and at The Stone in New York, May 28 and May 31, respectively. (I’m a Penn faculty member, but I can’t get my music heard on Penn’s quite commercial “non-commercial” radio station, despite that station’s supposed allegiance to “real musical variety” – at least my music can sneak into the station’s live performance space.) The Prism season also features a program of music by Greek composers, including Xenakis and Penn alum Stratis Minakakis; and a program of premieres, including music by David Rakowski, Lisa Bielawa, Perry Goldstein, Caro Haxo, and the quartet’s own Matthew Levy. Composer David Rakowski has begun blogging at Zio Davino. His earthlink website with the usual composer stuff and a lot more is still available. Davy is the real thing; I know this first hand from performing his Bogan songs a few times. He is best known for his massive collection of piano etudes – you can find performances of lots of them are on YouTube. I don’t know of a more important contribution to the piano literature by anybody of my generation.